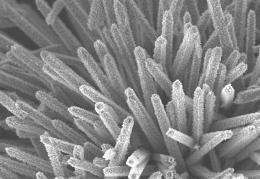 (PhysOrg.com) -- A University of Connecticut chemistry professor's nanotechnology research will be useful in alternative fuel development. A cover story in the September issue of Small, a prestigious nanotechnology journal, features a method developed by UConn chemistry professor Steven Suib for the production of a nano-sized crystalline material that will be used for energy conservation. 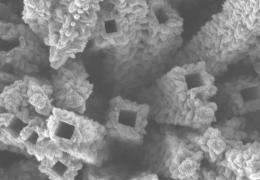 The issue, to be published next month, reports on basic science research into a new material that could be used as a catalyst in alternative fuel development. The nanomaterial, developed using Suib’s method, is tiny - smaller by far than even the head of a pin - and consists of two materials, one a template and the other a material that can grow around it in a well-ordered array. The growth can be controlled and uses solar energy to drive reactions such as the splitting of water into hydrogen and oxygen. The material can be a component of paint or can be applied to a surface, and will be useful in solar applications, says Suib, head of the chemistry department in the College of Liberal Arts and Sciences. The material acts as a catalyst in a process chemists call photocatalysis, which is the acceleration of a photoreaction in the presence of a catalyst. More information: The article was published online in May.